The Form 471 application window closed Wednesday, March 27, 2019. 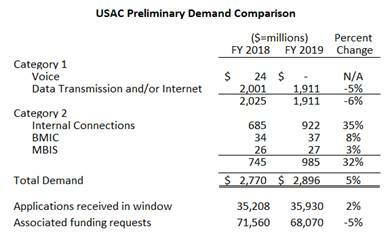 On April 1st, USAC released a preliminary demand estimate for the coming year showing a 5% increase to $2.90 billion from FY 2018. This is well within the $4.15 billion funding cap for the year (see DA 19-170). 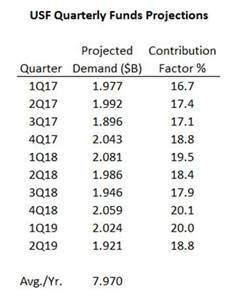 As shown in the following table, the demand for FY 2019 shows a drop in Category 1 requests — more than would be accounted for simply by the final eligibility phase-out of voice services — but a healthy increase in Category 2 demand. Issuance of the preliminary demand estimate, combined with the FCC’s approval (DA 19-218) of the PIA procedures the preceding week, positions USAC to begin FY 2019 funding waves later this month. USAC issued Wave 52 for FY 2018 on Thursday, April 4th, for $2.59 million. Cumulative funding as of Wave 52 is $2.19 billion. An item is being circulated among the FCC Commissioners that, if ultimately adopted, would set an annual cap (subject to annual inflation adjustments) on the Universal Service Fund (“USF”). Currently there is an annual cap on three of the four USF programs. In addition to the Schools and Libraries program, known as “E-rate,” the other USF programs are High Cost, Lifeline, and Rural Health Care. According to a recent blog post by Commissioner Michael O’Rielly, apparently the leading proponent for the proposal, the annual cap would be set at the total of the four programs’ current caps — currently $11.42 billion. To put the proposed cap in context, it should be noted that although USF demand varies somewhat from quarter-to-quarter, annual USF funding requirements are currently running well under the proposed cap. As shown below, total annual USF requirements, based on quarterly fund projections over the past two and a half years, have averaged slightly less than $8 billion per year. A key factor in this discussion, also shown in the table above, is the contribution factor. This factor represents the percentage of interstate telephone revenue that the telecommunications carriers are required to “contribute” into the USF fund each quarter. This contribution is passed on to telephone users as USF surcharges. As Commissioner O’Rielly notes in his blog, this contribution factor has been rising, recently reaching the 20% level. The increase can be attributed not only to increasing demand for USF funds, but to decreasing interstate telephone revenues. Much like the concern of a rising sea level with the melting of the polar ice caps, there is a question of how high the contribution factor can go without requiring a major restructuring of the USF — an issue long debated at the FCC. Should the total demand for the USF programs reach the $11.42 billion dollar cap being discussed, with no change to today’s contribution base, we calculate that the contribution factor would rise to almost 28%. In the short-term, cap or no cap, we don’t see that happening. But it’s a legitimate longer-term concern. From an E-rate perspective, capping the USF budget presents no immediate concern. As indicated in the FY 2019 summary above, total E-rate demand is well under the current $4.15 billion cap. Capping the total USF budget becomes an intermediate-term problem only to the extent that another USF program required additional funds and, rather than increase the total USF cap, the FCC chooses a rob-Peter-to-pay-Paul approach further constricting E-rate funds. From a timing standpoint, the USF budgetary cap proposal is only being circulated within the Commission. It is not an item on the Commission’s April open meeting agenda. At the earliest — if ever — we might see the proposal surface as a Notice of Proposed Rulemaking (“NPRM”) released for public comment in May. At that point, the E-rate community will likely have a vested interest in commenting. Note: Applicants missing any Form 486 deadline should watch carefully for “Form 486 Urgent Reminder Letters” in their EPC News Feed. These Reminder Letters afford applicants 15-day extensions to submit their Form 486s without penalty. April 9 Announced date for USAC to unlock EPC entity profiles. It is important to note that any changes applicants now make in their EPC entity profiles will not automatically carry through to FY 2019 applications. To make entity changes that apply to pending applications, applicants must submit RAL modifications (see USAC’s Schools and Libraries News Brief of March 22, 2019). April 17 USAC webinar on the Program Integrity Assurance (“PIA”) review process. May 15 USAC webinar on the Form 486. The FCC issued its March set of “streamlined” precedent-based decisions (DA 19-213) on March 29th. Applicants facing similar problems as addressed in these decisions may garner useful information by carefully reading the additional FCC explanations found in the footnotes. The original appeal and waiver requests can be found online in the FCC’s Search for Filings under Docket 02-6. Dismissed as moot two Requests for Review on which USAC had already taken the requested action. Dismissed six Petitions for Reconsideration for failure to identify any factors not already fully considered by the Wireline Competition Bureau. Two lengthy footnotes on these dismissals are instructive. In one case the applicant argued that it had been unable to file a BEAR because its service provider had not filed its annual Form 473 (“SPAC”) and did not sign the BEAR form. The FCC rejected this argument as a valid basis for an invoice extension noting that this was a service provider problem, not a USAC processing problem. One Request for Review of the 28-day Form 470 posting requirement which was only missed by 1-3 days. Two Requests for Review and/or Waiver of urban/rural classifications for which the FCC disagreed with USAC’s analysis. Two Requests for Review and/or Waiver permitting, despite the suspension of the amortization requirement, buildout expenses to be incurred as ongoing monthly recurring costs. One Request for Review and/or Waiver upholding an applicant’s right to reject incomplete and/or non-responsive bids. Three Requests for Review giving applicants an opportunity to refile invoices on remand. One Request for Review confirming the principle that E-rate discounts are based on the price of service prior to the application of any state-provided support. Two Requests for Review and/or Waiver granting relief from the Form 486 deadline involving forms filed before January 30, 2017, when the FCC adopted a more rigid standard for late-filed Form 486s. Four Requests for Review and/or Waiver for various ministerial and/or clerical errors. Twelve Requests for Waiver involving late-filed Form 471s for FY 2016 under similar circumstances as granted to the Pribilof School District (see FCC 18-188 as discussed in our newsletter of August 13, 2018). One Request for Review relieving an applicant of the responsibility for not providing inventory records for equipment not delivered by the service provider. Two Requests for Waiver of the deadline for appeals involving errors by USAC. Two Requests for Waiver for late-filed Form 486s. Fourteen Requests for Waiver of invoice deadlines. Six Requests for Waiver of Form 471 filing deadlines. Twelve Requests for Review and/or Waiver of late-filed appeals or waivers. Reply comments to the FCC’s Notice of Proposed Rulemaking (“NPRM”) and Order (FCC 19-5) to permanently eliminate the pre-FY 2015 rule requiring a three-year amortization of special construction charges of $500,000 or more were received from the following organizations. The ambiguity around the use of the “cardinal change rule” to force denial or re-institution of bidding processes. The transition of Client Service Bureau (“CSB”) operations to a new call center contractor, Sutherland Government Solutions. The signing of a new Business Process Outsourcing contract with Maximus Federal Systems to begin handling PIA review functions as of 2019. The reduction of the number of onsite training sessions while expanding the number and scope of online training modules for both applicants and service providers. 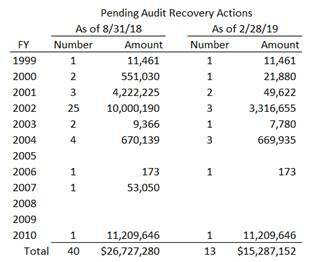 USAC released a Semi-Annual Audit Recovery Report (and an associated spreadsheet) for the period ending February 28, 2019. The Report reviews the process for recovering funds based on previous audit findings and summarizes the status of audit findings outstanding for more than six months. One interesting aspect of these semi-annual reports that we’ve been tracking over the past year has been USAC’s renewed focus and recovery efforts on audits covering funding years from 10-20 years ago. USAC began issuing Notification of Commitment Adjustment Letters or Notification of Recovery of Improperly Disbursed Funds Letters in early 2018. Applicants receiving letters subjecting them to the potential repayment of E-rate funds disbursed so many years ago are justifiably upset. As shown in the table below, what the latest semi-annual report indicates is that many of the pending actions reported last summer (see our newsletter of October 15, 2018) are still pending. In the interim six-month period, the number of pending recovery actions for FY 2010 or earlier has dropped from forty to thirteen, but the funding at risk still exceeds $15 million. E-rate is mission critical. 88% of applicants believe that E-rate is vital to maintaining their Internet connectivity. WiFi demand is surging. 51% of networks will require upgrades within 3 years. Higher Category 2 budgets are needed. 45% believe that the C2 budget factor should be $250 per student. Applicants need dependable Internet. 74% want the FCC to allow E-rate support for backup connections. The “homework gap” remains a concern. 82% describe the lack of home Internet access as a significant issue. 48% think that the EPC portal has improved, but 44% say that E-rate is not fast, simple, or efficient. This year, with the FCC considering changes to Category 2 funding, we believe that it is especially important for the E-rate community to be proactive. We encourage all E-rate applicants to visit FFL’s 2019 survey site and express their views.